Gives your skin a fresh and radiant appearance. Delivery Time: This product is not available at the moment. 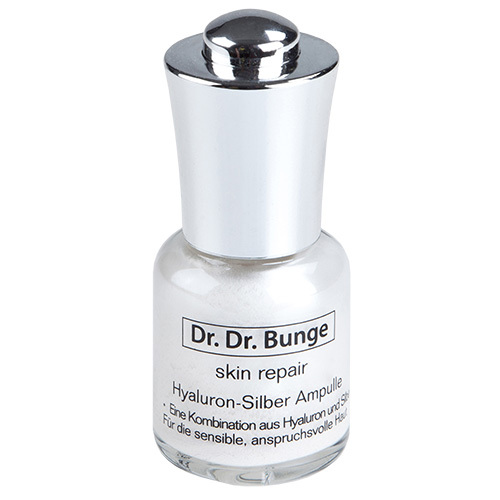 A combination of hyaluronic acid and silver. For all skin types, even for sensitive, easily irritated skin. „I want to protect our skin and help it to be healthy but not overwhelm it“. That’s why we developed our Hyaluronic-Silver Serum, an optimal combination of hyaluronic acid -which is a natural skin moisturizer - and Timiron, a special silver pigment to reduce optically minor wrinkles. Timiron also acts as an antibacterial and skin nurturing agent. With my Hyaluronic-Silver Serum I am offering you a new generation of anti-aging skincare. The moisture-binding and nourishing properties of this serum give your skin a fresh and radiant appearance. It is a moisture booster, created for all skin types, including dry and sensitive skin. It also gives your skin a silky shimmer.